Customer- This file includes basic customer information like name, address, and other contact information. Payment Method- This file contains payment method information. You can upload credit card or bank account information. Each customer can have more than one payment method. Billing Schedule- This file contains customer billing schedules. Each customer can have more than one billing schedule. Combined- This file combines all of the information above into one file. Before you upload the file to the console, you will need to make sure it is in the right format. Below you will find example templates of each file, and the definition of each field available for import. Please Note: There are some gateway generated required fields (Customer Number, Method ID, or Schedule ID), that you need to updated existing customers, billing schedules or payment methods. To find these fields, export your current customer list, and they will be included. This file includes basic customer information like name, address, and other contact information. Customer Number X A unique customer number assigned by the gateway. If you are updating customer information, this is required. If you are adding this customer as new, this field should say add. Customer ID An ID that the merchant assigns to each customer. Can contain letters, numbers, and dashes -. Company X The customer's company name (not required if a First AND Last Name are included). First Name X Customer's first name (not required if Company is included). Last Name X Customer's last name (not required if Company is included). Address 2 Second line for customer's address. Can contain Apt or Suite number. Notes Any notes or additional information you would like to document. These notes are internal and will not be seen by the customer. This file contains credit card or bank account information for the customer. Once you upload the payment method, you can use the payment on file to charge in the New Order section of the console, or you can set it as the default payment for a recurring billing schedule. Each customer profile can contain more than one payment method. If it there is more than one payment method listed for a customer, the payment method listed first in the file will be the default payment method. Please Note: When using the payment method file, you MUST be attaching the payment methods to current customers. If the payment method is NOT attached to a current customer profile, then it will NOT be uploaded. Customer Number Both X A unique customer number assigned by the gateway. This tells the system which customer the payment method belongs to. If a customer has more than one payment method, then you will have more than one line with the same number. Method ID Both X A unique number assigned by the gateway for each payment method. If you are updating the method information, this is required. If you are adding this customer as new, this field should say add. Payment Method Name Both A label you give the payment method. This is for your reference and does NOT have to be the name on the card. Payment Method Type Both X The type of payment method: enter cc for credit cards and check for bank accounts. Format ACH The check format. Click here for more information on check formats. Account Type ACH Categorizes the customer's bank account as either checking or savings. Drivers License # ACH Drivers license number used to verify customer's identity. Drivers License State ACH The state that issued the above drivers license (also for identification purposes). Card Number Card X Customer's card number. Expiration Card X The expiration date for the above card. The system accepts many different formats including, MMYY, MMYYYY, MM/YY, MM/YYYY, etc. See the Credit Card Template file above for more examples. AVS Street Card The billing street for the card. If you have implemented the AVS Response Fraud Module, this is the address we verify with the bank. AVS Zip Card The billing zip for the card. If you have implemented the AVS Response Fraud Module, this is the zip code we verify with the bank. This file contains recurring billing schedule information. 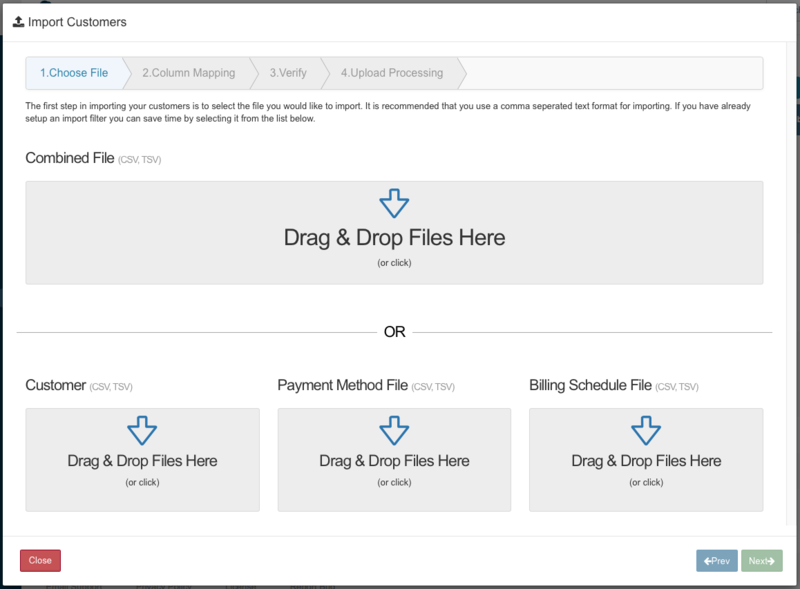 Each customer profile can contain more than one billing schedule. Below you will find templates for three different billing schedule frequencies: weekly, monthly, and yearly. At the moment it is not possible to import a daily billing schedule, you can only create this schedule manually on the console using the weekly schedule as a base. Please Note: When using the payment method file, you MUST be attaching the billing schedules to current customers which have payment methods. If the payment method is not attached to a current customer profile, then it will not be uploaded. If that customer profile does not have a payment method attached, then the customer will receive an error when the schedule attempts to run. The following template includes weekly, monthly AND yearly schedules. You can also find templates for each individual frequency listed in the sections bellow. The fields below will be used across ALL billing schedules frequencies. Customer Number X A unique customer number assigned by the gateway. This tells the system which customer the schedule belongs to. If a customer has more than one payment method, then you will have more than one line with the same number. Schedule ID X A unique number assigned by the gateway. If you are updating the schedule information, this is required. If you are adding a new schedule, this field should say add. Enabled X Enter 1 if you would like this billing schedule to be enabled, enter 0 if you would like the billing schedule to be disabled. Default is disabled. Start Date X The date you created the billing schedule in the database. For your reference. Next Date X The first time you would like the customer to be billed. Num Left X Number of transactions remaining in the recurring billing cycle. This should be set to -1 if there is no set end date. Tax Amount you would like to charge for tax. Tax + Amount = Total Amount Charged. Amount X Subtotal BEFORE taxes. If there is no tax entered, this is the total amount that will be charged. If there is tax entered, Tax + Amount = Total Amount Charged. Send Receipt Set to 1 if you would like an email receipt sent. Set to 0 if you don't want a receipt sent. Defaults to disabled. Remember: If the customer does not have an email on file, a receipt will NOT be sent. Receipt Note A message you would like to send your customer with each emailed receipt. Frequency X How frequently the customer is charged. This should be set to weekly to charge weekly. Skip Count X This represents how many weeks you would like to skip between payments. For example, enter 1 to process every week, 2 to process payments every other week, or '3' to process payments every three weeks, etc. Day X This indicates which day of the week the payment should run. Days of the week should be formatted as mon, tue, wed, thu, fri, sat, or sun. Frequency X How frequently the customer is charged. This should be set to monthly to charge monthly. Skip Count X This represents how many months you would like to skip between payments. For example, enter 1 to process every month, 2 to process payments every other month, or '3' to process payments every three months, etc. Day X For monthly billing schedules, this should be set to Day. Day Offset X This is the day of the month you would like to bill the customer. For example, enter 1 to bill on the 1st, 2 to bill on the 2nd, etc. To bill on the last day of each month, enter -1. Frequency X How frequently the customer is charged. This should be set to yearly to charge yearly. Skip Count X This represents how many years you would like to skip between payments. For example, enter 1 to process every year, 2 to process payments every other year, or '3' to process payments every three years, etc. Day X For yearly billing schedules, this should be set to Day. Month Offset X This is the the month you would like to bill the customer. For example, enter 1 to bill in January, 2 to bill in February, 3 to bill in March, etc. The combined file combines all of the information above into one file. Below is a template for the combined file. All available fields have been explained in the sections above. Once you have prepared your file (again, remember the file must be saved as .csv), follow the steps below to upload the information into your customer database. To upload the file, click 'Import' located at the top right hand side of your Customer Database page. Drag and drop the file to import into the ‘Drag & Drop Files Here’ section of the file type you are importing (combined file, customer file, payment method file or billing schedule file), or click to find the file. When the file is uploaded, the gateway will automatically try to match the column titles with the correct fields. If the system does not recognize the column name, choose the correct field from the drop down menu. If you have some fields that do not have corresponding fields in the system, select 'Ignore' to upload the file without those columns. Once all the fields have been mapped, click 'Next' to continue to the next step. In this section you will review any errors and select the correct upload settings. File Type- The type of file you selected to import (customer, payment method, billing schedule, or combined) and the file format (csv). File Size- The size of the file. Total Import- The total lines in the file you are attempting to import. Total Errors- The lines which resulted in an error. Total Importable- The lines which will be successfully imported. If there are any lines in the file which cannot be imported due to an error, you will see the errors listed below the information section (see image below). As you can see, it shows which fields are required and how many of the lines are missing the information. Important All Records As New- Check this box to import ALL information as new. This includes any duplicate information. 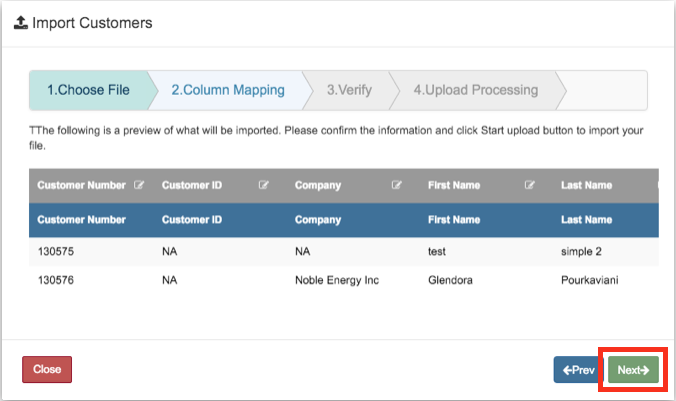 Update Existing Records- Check this box to update existing customers and import new customers. This window shows a status bar and will display when the file has uploaded successfully. Click 'Close' when you are done. You will then be taken back to your Customer Database. Refresh the page, and then you should see the new customers you have uploaded or updates you have made to current customers.